On the morning of Friday, February 14, 2014, residents of Yogyakarta, Indonesia woke up to an unwelcome surprise: the so-called “Indonesian snow.” Yogya, as well as many other cities and villages in Central and East Java, were covered in hujan apu (ash rain) from Kediri, East Java’s Mount Kelud, which erupted with little warning during the night. 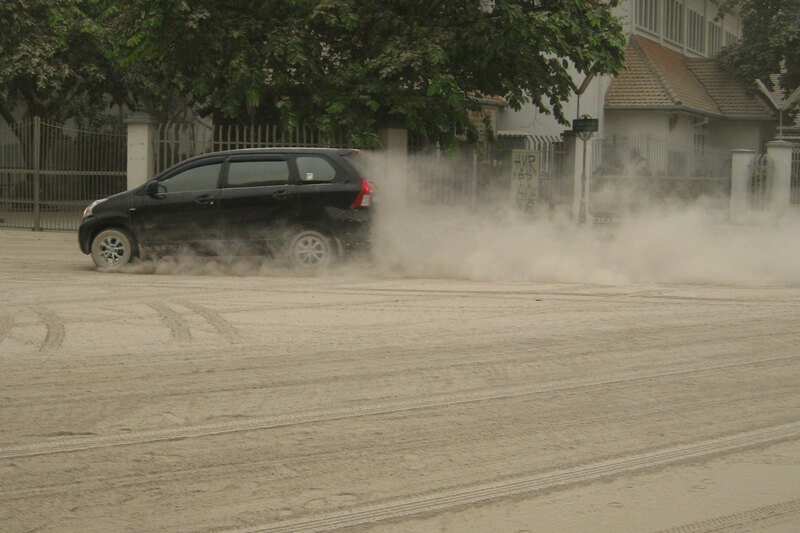 The ash caused a multitude of problems for cities, one of which was impaired visibility on the roads. Not many people ventured outside on the morning of the 14th, but those who did could barely see meters in front of them on the dusty main streets. Six of Java’s airports were closed for days following the eruption. Although Yogyakarta’s own Mount Merapi erupted in 2010, causing over 300 deaths, the ash from Mount Kelud’s eruption is much worse, despite Kelud being nearly 300 kilometers from Yogya. 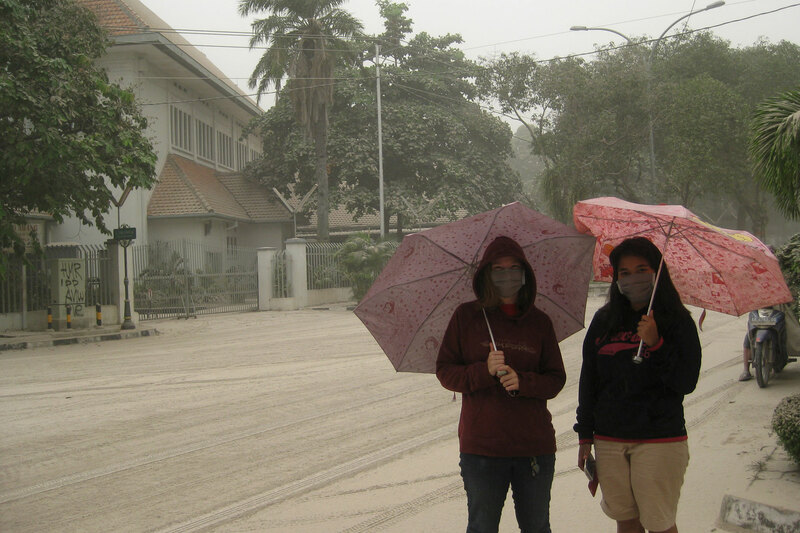 As a result, most of the Indonesian students I live with in my boarding house had never seen ash like this before, either—and so it was the perfect time for a photo op, outfitted with necessary ash masks and umbrellas to protect from the still-falling particles. After two days off from school due to the ash, students finally returned to SMA N 3, the local public high school I teach at in Yogyakarta. Not for classes, however: predictably, ash had gotten everywhere and Sunday’s short rain shower had turned much of it into mud, caking our expansive courtyard with the hard-to-remove substance. On Monday, students and teachers worked together to clean up the school by dusting and wiping down classrooms, mopping floors, and doing other work. 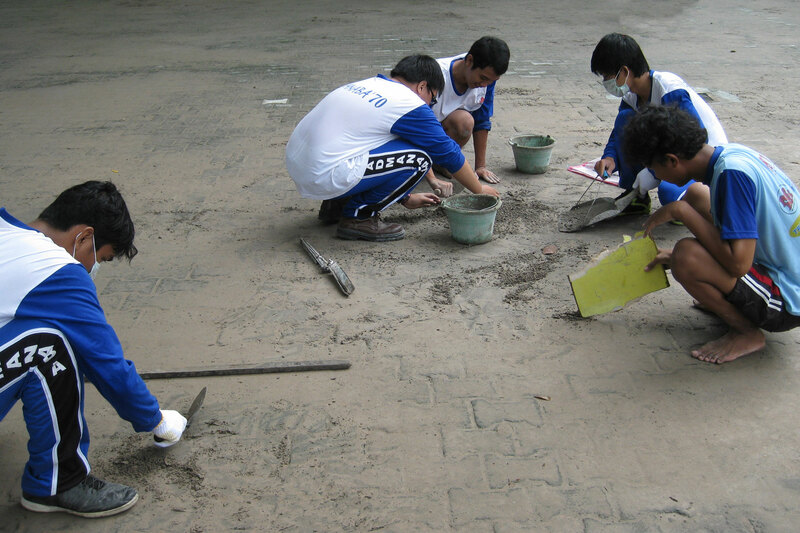 Here, students use a variety of tools to scrape mud off of bricks and put it in buckets. The tricky thing about cleaning up ash is that unlike snow, it doesn’t just melt away eventually. 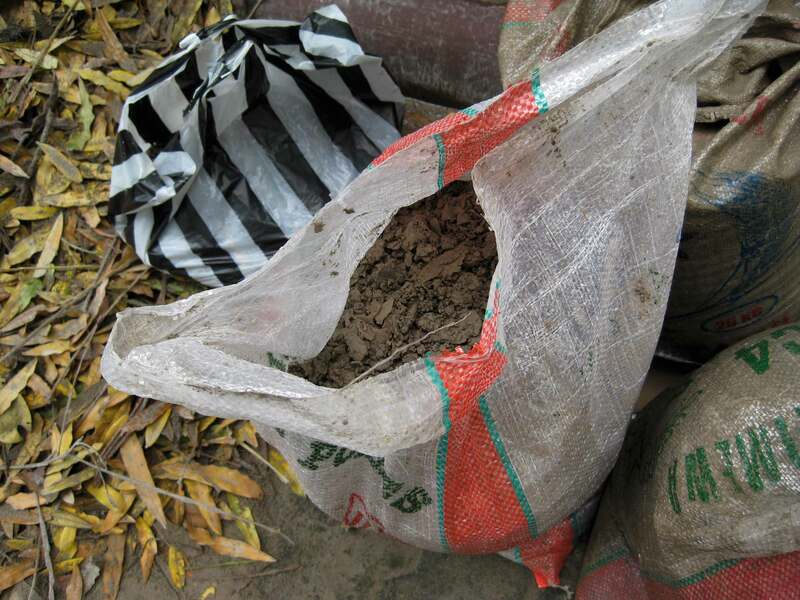 Instead, the ash is packed away into bags. For days, these bags have lined the streets, waiting to be disposed of. By now, two months after the eruption, most of the ash is gone from the streets, only gathering in neglected cracks and corners. Monuments like Candi Borobudur and Candi Prambanan were closed for about a week after the eruption, but now are filled with visitors again. Bags of ash were shipped and sold as building materials and fertilizer, and now there are only a few sacks left on the street corners. About the author: Gillian Irwin is a Fulbright English Teaching Assistant in Yogyakarta Special Region. She graduated from Muhlenberg College in 2013 with a degree in Music and English.